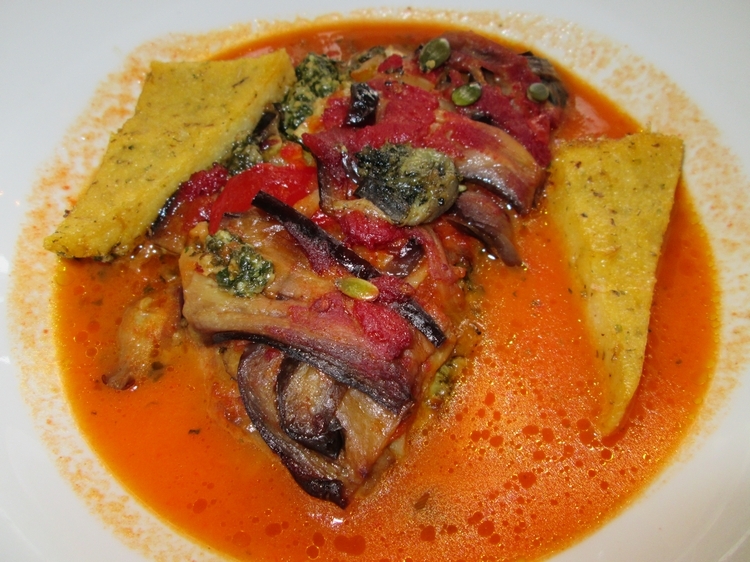 Restaurant review #13 – De Broers van Julienne is a restaurant in Antwerp well-known for its many vegetarian options. They mainly work with organic ingredients. Several sites list this as a vegetarian restaurant, but it is not (also serves fish). It also has some vegan options standardly available. I had been to De broers van Julienne on my own a couple of years ago, and wasn’t really impressed. It was on a cold snowy winter day, and although I had hoped to warm myself in the restaurant, it was unpleasantly cold inside. Don’t know whether their heating system was broke or if it was always like that, but there was a small heater placed in the middle of the room, that really couldn’t heat the spacious place. I remember a waitress who could hardly speak any Dutch, and replied to my question whether a certain dish was vegan: “gluten free?”. It wasn’t that reassuring and I can’t even remember what I had for lunch at that visit. I did remember the uncomfy chairs and slow service though. So I was a bit reluctant to go again, but being together in Antwerp, we decided to give it another try. I phoned at noon to make a reservation for two and that was no problem. I specifically inquired whether we could get something vegan, but I got the impression the waiter didn’t really understand me. Arriving at the restaurant, it seemed a reservation was totally needless, since all the tables inside were free. The outdoor tables at the back terrace were nearly full tough, being a nice Spring day. 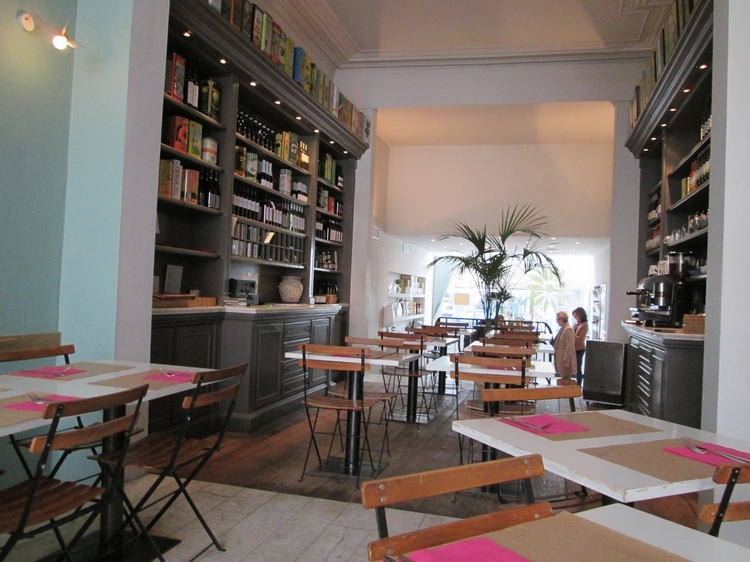 The restaurant decor is nice, with high ceilings and a variety of olive oils and wines stalled in wall cupboards. 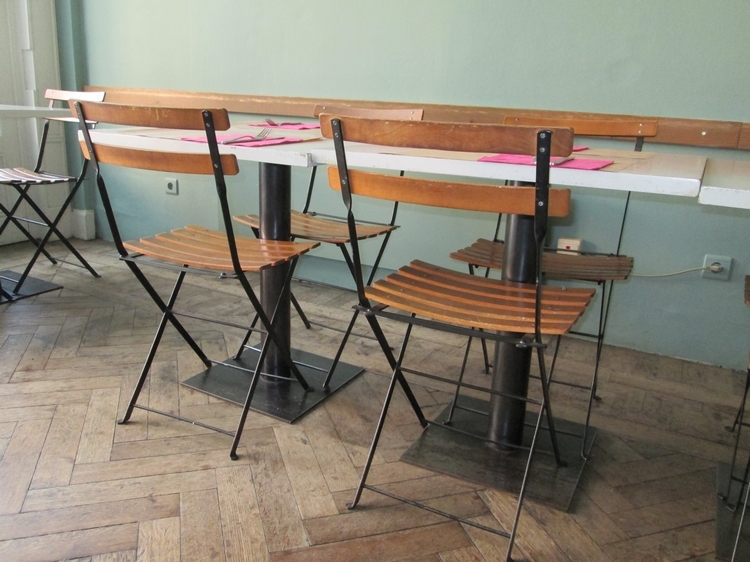 The chairs are horrendously uncomfortable though and certainly don’t invite for a long dining session. Glancing over the menu, it wasn’t really clear which dishes were vegan or not. There was one dish which was specifically marked as vegan, but it contained quorn (note: quorn is not vegan, contains egg). So we asked the waiter which dishes were vegan or could be veganised. For example whether the tempura contained egg (yes). After some questions, it seemed to have sunk in that we wanted something vegan, and he gave us a separate menu list, with vegan options specifically mentioned (and also, gluten free, sugar free and garlic free options). I went for the eggplant au gratin (17,90€). My partner ordered a soup of the day (4,90€) and the Julienne stew with regular tofu (12,90€). I ordered some olives as an appetizer (3€), as I got the impression we could be in for a long wait before being served lunch (turned out we did). There was a large party seated on the outdoor terrace and it was clear the waiter had his hands full going back and forth to serve everyone outside. He came back to ask whether the Julienne stew should be served with pasta or rice? Upon inquiring whether the pasta was vegan (egg free? ), he replied: ‘gluten free?’. Aargh… So rice seemed the safest option. The host served some bread slices to go with the soup, accompanied with the traditional butter cup on the side. Classic mistake, which we’ve encountered a lot at restaurants. Although I would expect a restaurant with special attention to vegan patrons to be more attentive to things like this. The soup was nice, but nothing exciting. It did however contain a piece of hard plastic, presumambly from some sort of packaging material. The host apologised, and said he had mentioned it to the kitchen staff. The main dishes were not bad, but not really warm. And it took really long before we were served our dishes (over an hour). So afterwards we didn’t fancy looking into the desserts and ask whether any of them were vegan. After lunch and having our table cleared, we didn’t see the waiter nor the host for quite a while, so we decided to go wait at the counter to get the bill, where two other people were waiting to buy from the catering service. It took us another 10 minutes or so before we could pay and leave. Overall our visit was one hour and 45 minutes. Way too long for a soup + main dish. Unfortunately my not so good impressions from the earlier visit were reinforced: slow and poor service, uncomfortable seating. 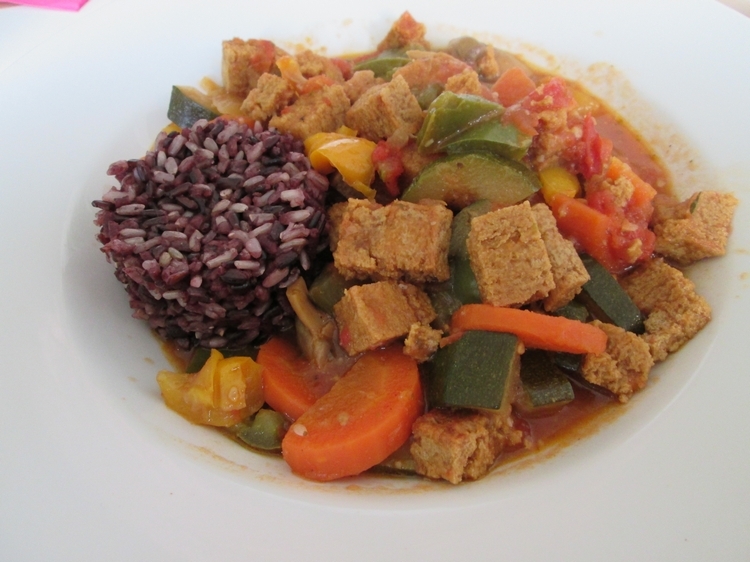 Vegan is standardly available (although we would advise you to double check), but no exciting culinary journey. Luckily, the well packed and lovely kitchen shop Antwerps kookhuis, is two minutes away (see our review here), which well made up for the disappointing experience at De broers van Julienne. Thanks for your feedback Nathan!